It was shortly after I moved back to Kansas from Michigan that my high school friend (ever-since-kindergarten-friend, really) Marc Friesen told me about the Kansas Ultrarunners Society and the races they held in the area. Running hasn’t really been my thing, but Marc has been an avid runner ever since cross country running in high school. He pointed out that the route of the Heartland 100 ultramarathon (yes, they really run 100 miles!) ran through areas of the Kansas Flint Hills with weak or nonexistent mobile phone coverage, and suggested that our common interest in amateur radio might hold a solution to the problem of poor communications between stations along the route. Each year, on a Saturday morning in October, runners from across the United States and beyond will gather in Cassoday, KS, the Prairie Chicken Capital of the World, to run the Heartland 100. The race begins in Cassoday and follows a winding 50-mile course through the scenic Flint Hills. Reaching the end of the route, northeast of Matfield Green, the runners turn around and backtrack the same route to reach the finish line in Cassoday. The winner of the race usually finishes sometime in the very early hours of Sunday morning, followed by a stream of runners throughout the remainder of the morning. Aid stations are positioned along the route to provide food and water for the runners, since it wouldn’t work for a person to carry enough of either to complete the route. Volunteers at the aid stations provide nourishment and encouragement for the runners, as well as tracking their progress. Each aid station has a cutoff time by which each runner must pass the aid station or be dropped from the race. The Ridgeline aid station is one of three stations that can be accessed by runner’s crew members. When Marc (KC0TMH) and I first experimented with amateur radio during the Heartland 100 we were the only two operators, communicating between two of the aid stations in the middle of the route. We operated simplex, passing runner information and general conversation. The next year, we included another operator who was a KUS member. In the following years, we tried a few different arrangements and added a few operators, eventually involving the Newton Amateur Radio Club. McPherson and Emporia clubs have also been reliable partners providing operators for the event. Our amateur operation has evolved to provide operators for all of the attended aid stations, using the Matfield Green repeater to cover the entire race route. We operate a net control station at the start/finish line in Cassoday, where we work with the KUS race director to relay information to those who need it. A normal day at the race begins with the 6am start. We don’t usually cover the first two aid stations on the outbound leg, since the runners are still bunched up and it’s unlikely that many will drop out that early. I arrived in Cassoday late on Saturday morning, October 14th to set up the net control station. Charles, K0HNC, was already in position at Teterville Road, and we coordinated our rosters and checked out the online spreadsheet we were testing. Operators at aid stations with cellular data coverage were able to update the spreadsheet with runners’ times and share that information more efficiently than we could over the radio. It worked well, and we’ll be making it even more useful for future events. Thanks to Jay (KS1EMS), Jordan (K0JWH), and Charles for their work to make that possible. Throughout the afternoon and into the evening we tracked runners, coordinated supplies for the aid stations, and arranged rides for runners who dropped from the race. Operators arrived for their shifts at the various aid stations and departed when their stations were closed. 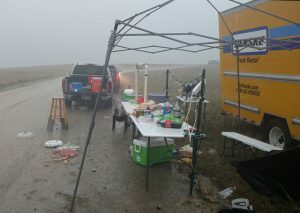 A truck and cleanup crew traveled down the course during the night to pack up the aid station tents and equipment. About every two hours during the night an aid station closed, and any runners who hadn’t reached that point were given a ride back to Cassoday. The cleanup crew also performs an important safety function, making sure that no runners are left behind when the race is over. The last station on the return route, Battle Creek, is where our radio operators are really essential, as the cellular coverage is thin to nonexistent in that area. Larry (N0YNN) and his wife Rhonda covered that for us through the night. The weather is always a factor. Some years heat causes problems for the runners. This year, it was thunderstorms, wind, and cold. With Saturday afternoon thunderstorms and a 40-degree temperature drop from noon to midnight, we had an unusual number of runners who dropped out this year. I can’t really blame them, since I wouldn’t have made it nearly as far. It’s important that we keep each of the aid stations updated on the list of runners, so they know who to look for and who has dropped out. After the last aid station was closed, I sat down with Elden Galano, the race director, for a final comparison of our lists to make sure that we had accounted for all of the runners. There were still runners on the final segment of the course and a couple of hours left before the noon cutoff time at the finish line, but the last radio operator had secured his station and our service was complete. 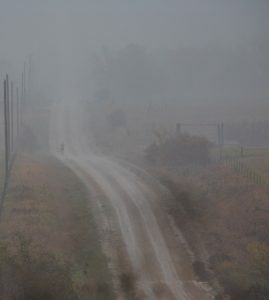 In the spring we’ll be back in Cassoday for the Heartland 50, and next October for the Heartland 100. 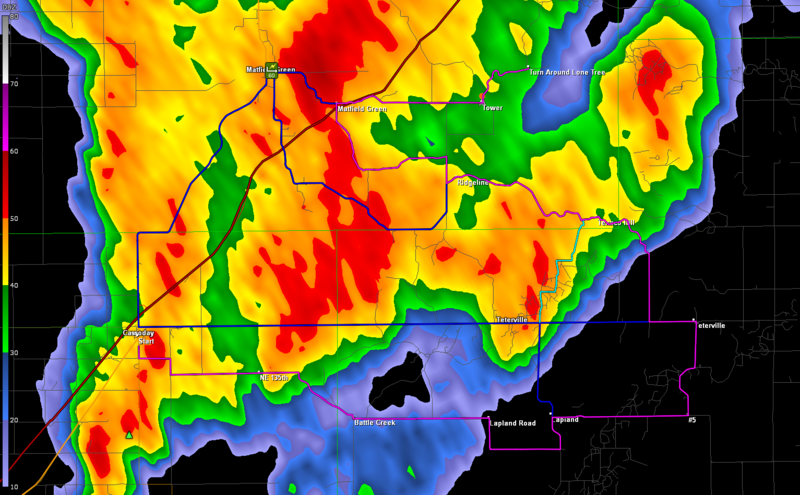 The storms passing over the course, outlined in purple. In addition to those operators named above, I’d like to thank Russell (WX0RG), Jeanne (KS0JG), Stewart (KC0WEB), Lonnie (W0NXS), David (AD0SF), Bob (N0QIX), and Amber (KD5SIM) for their time, effort, and support at the aid stations. You made it possible to get this done. This has been an interesting exercise in emergency communications, and very educational for me. I’m looking forward to next year! Awesome write up Aaron! Can’t wait for the next event!!! The 2018 race just happened a couple of weeks ago, and there hasn’t been any announcement yet for 2019. The Heartland 50 is coming up on April 27th, and the Heartland 100 on the second weekend of October. We’d be happy to have you there.